Will Northern Ireland be renamed "West Belgium" according to the latest proposed Brexit deal? No, that's not true: the story was made up by a satirical website but several people were sharing it online without that context. The whole thing is not real. THE finalised Brexit deal imposes full EU rules on Northern Ireland, changes its official language to Flemish, bans religion and renames it West Belgium. The deal also creates a 190-mile tidal barrier down the length of the Irish Sea which UK citizens can only cross via a customs point on the Isle of Man but EU citizens can pass through wherever they like. EU negotiator Michel Barnier said: "I don't think anyone can have any problem with this. The Belgian royals are quite Catholic, banning religion would not appeal to them. There's no way Flemish would become the official lanugage without heavy compensations being demanded by the French-speaking minority in Belgium. If you think negotiating Brexit is complicated you haven't seen any Belgian politicians negotiate among themselves. The famous art of the "Belgian Compromise" consists of negotiating as long as it takes to reach a deal that makes everybody equally unhappy. 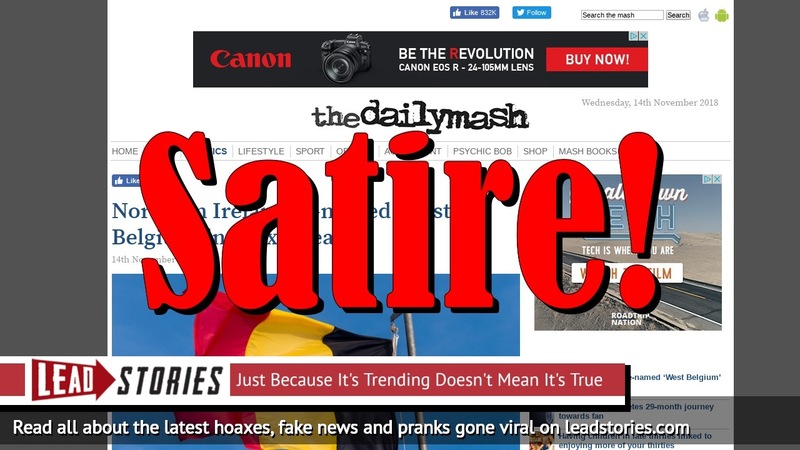 The Daily Mash is a satirical website which publishes spoof articles, i.e. it is all made-up and is not intended, in any way whatsoever, to be taken as factual. Glad we've got that sorted. Their articles are generally quite funny but now and then they get mistaken for real news.